Today is a very exciting day for me. 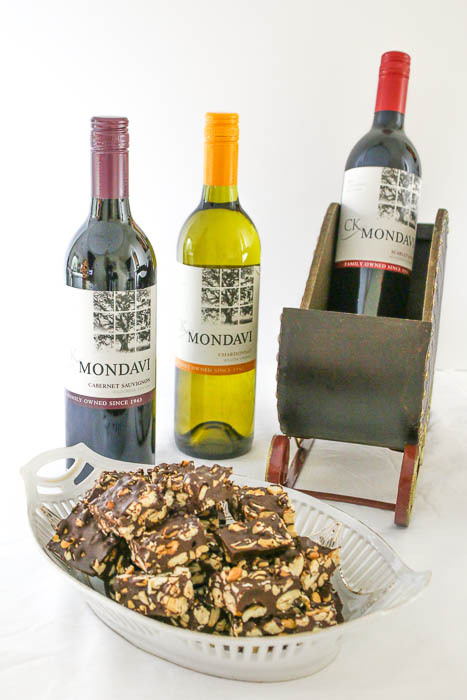 I am now a Brand Ambassador for CK Mondavi Wines and today’s Chocolate Cashew Bark is my first post for them. I met Janet Mondavi at Food Wine Conference 2016. I listened to Janet talk about the rich history of her family’s vineyard that was purchased in 1943 from the Charles Krug Winery. The vineyard is still in the family and today it’s run by members of the third and fourth generation. There were many tidbits that were shared about life on a vineyard and the hard work and dedication it takes. I have tremendous respect for the company and love that everything used to produce and manufacture CK Mondavi Wines is made in the USA. One of the fabulous things that comes with having a large family (and work family) is that entertaining happens often and is filled with complementing flavors. The Mondavis love to entertain and know what flavors work well together. The Mondavis also know how to make me happy. 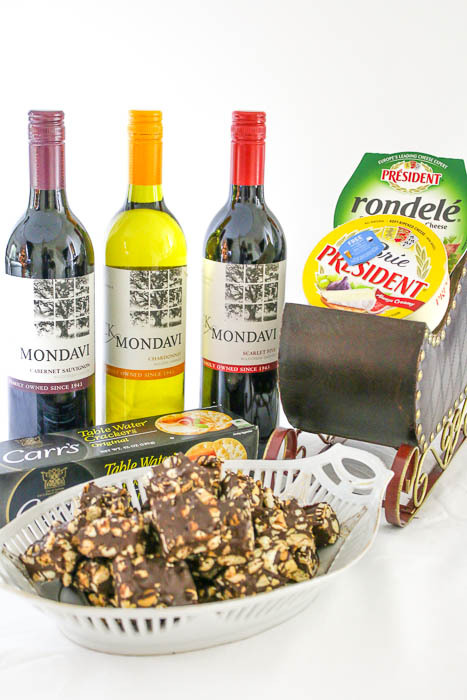 I loved opening my package of CK Mondavi Cabernet Sauvignon, Chardonnay and Scarlet Five along with a tub of Rondelé® gourmet spreadable cheese, a mini-wheel of Président® Brie and a package of Carr’s table wafer crackers. Talk about getting a party started! CK Mondavi Cabernet Sauvignon is a medium to full bodied wine that has a classically deep red color and is rich with cherry and blackberry flavors. CK Mondavi Scarlet Five is a full-bodied wine that offers ﬂavors of black cherries and plums and their Chardonnay is a lighter wine with aromas of lemon and citrus combined with flavors of apple and pear that lead to a delightfully crisp finish. It’s easy to understand why all three pair beautifully with Président® and Rondelé® cheeses as well as Chocolate Cashew Bark. 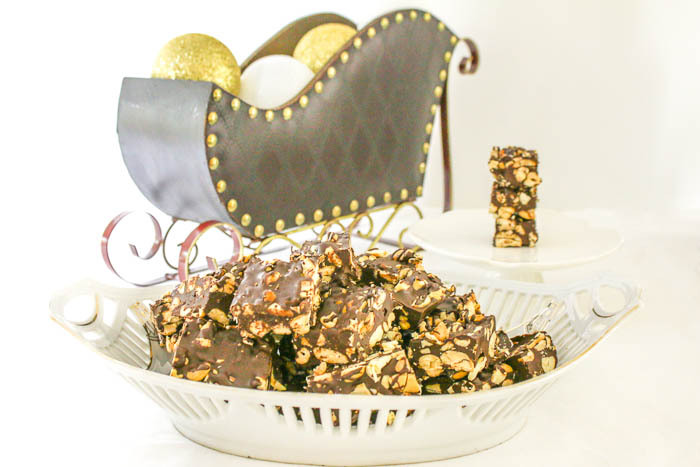 The key to insuring cashews in every bite of Chocolate Cashew Bark is to place a layer of cashews in the baking pan before covering them with a decadent chocolate bath. Top with more cashews and then sprinkle sea salt over the top. Do not use salted cashews as it is much harder to control the amount of salt. 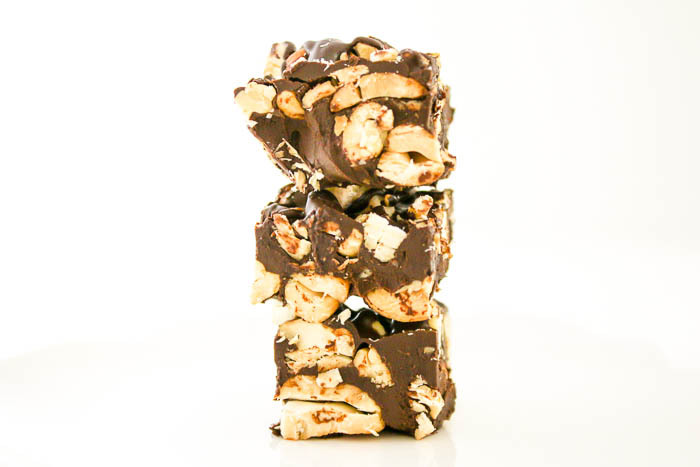 The salt should be used to entice the flavors of the nuts and chocolate not overpower them. 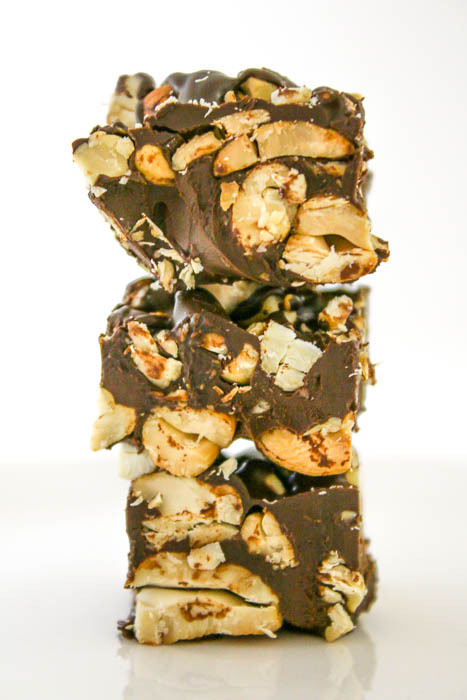 The final touch for the bark is drizzling chocolate over the top to act at the ‘glue’ holding the top cashews in place while the bark is cut. We have a holiday party going on and here’s a way to make it even better; CK Mondavi is having in-store promotions with Rondelé® gourmet spreadable cheese and Président® Brie. Be sure to look for CK Mondavi’s special holiday promotions on their wine bottles in stores now through January 31, 2017. You can receive $1 off Président® Brie, $1 off Rondelé® by Président® and $1 off any crackers now through January 31, 2017. For more information on Président® Brie, click here. For more information on Rondelé® by Président®, click here. You can also enter to win a wine country weekend in Napa by texting CKMONDAVI to 31279. The deadline to enter is 12/31/16. The best way to stay in the loop of what CK Mondavi Wines is doing is to follow them on social media. Here are the links: Facebook, Twitter (@ CKMondaviWines), Pinterest, Instagram and YouTube. This recipe cuts into 60 pieces. It may be halved or doubled, just adjust your pan size accordingly. Line a 9" x 13" baking pan with heavy duty aluminum foil. Cover the bottom of the pan with a layer of toasted cashews. Break the remaining cashews into smaller pieces and set aside. Cover the cashews with melted chocolate. Use a small metal spatula to make sure all of the nuts are covered. Sprinkle the remaining cashews over the chocolate. Sprinkle with sea salt, to taste. Use the tines of a fork to drizzle the remaining chocolate over the top. This will act as the 'glue' to hold the top cashews in place when they are cut. Place the pan in the freezer for 15-20 minutes. The chocolate will be firm enough to cut but not so hard that the chocolate will not easily cut. This post is sponsored by CK Mondavi Wines. All opinions are my own.